Zachary Hamilton’s email prefix is zachabstract, which might provide a hint to reading and understanding his poetry. What do textiles, butterflies, skin cancer, technology and scientific jargon with an undertow of nearly apocalyptic forboding all have in common? “Washington county outdoor school” certainly appears disjunctive, abstract, and in trying to open it up I wondered if the poem might be flarf (poetry composed of googleable words and phrases). I found out it wasn’t, however googling the many unfamiliar words scattered throughout the stanzas like dabs of paint or the colored scales on the wings of butterflies I began to discern patterns from examination first up close and then panning further away. Literally, the poem looks like Zach is collaging together the latin genus and species names of butterflies and anatomical terminology as well as phrases of habitat description and the plants they depend on from field guides. But that is not all we have here. Some of the individual words lead us to a subtext so understated and subtle it may or may not be intended; it’s questionable, but ultimately I believe it is there. On the surface the poem contains moments of discrete meaning and phrases not so much meant ‘to mean’ in any kind of lyric or narrative fashion so much as they are to be for the reader fleetingly impressionistic, to head us down certain trains of thought, evoke mood and texture ambiguously. All the while retaining personal significance, betraying obsession and preoccupations of the author through recurring motif yet withholding explicit statement directly. This makes them hard to pinpoint and paraphrase. I think they are the product of a mature idiosyncratic vision while offering the appearance of abstraction to the reader because we are being introduced to Zach’s view via the window of brief poetic glimpse which builds on itself accumulating within each poem, and through a succession of poems by this author. Outdoor schools in Oregon (Portland specifically), say in their mission statement they are to develop environmental literacy, responsible citizenship and appreciation for the natural world with hands-on experiences within local school curricula, and this provides a context and backdrop for what follows. “Arc.tic Eur.ope…” brings to mind the race to the arctic for oil reserves and multinational corporate interests with representatives from China, Russia, the US and Europe. Why is it suddenly possible to drill and the sudden race to the arctic? Because ice caps and glaciers are melting so rapidly due to global warming. It’s a nuance and a gesture and I can’t confidently claim it’s intended—it’s a suspicion. On a literal level, Zach is describing with Salix (genus) a willow, and with Boloria (genus) of a Fritillary butterfly and their environment. A ‘discall cell’ is a specialized technical term for something on the wing of the butterfly, whether descriptive or anatomical isn’t clear, but to capitalize and hyphenate the word as Zach does certainly connotes to me the classical sense of “Dis,” another name for Hades. A “basal spot” can either refer to another anatomical description of insects or skin cancer. The use of “invaded” in this poem tips the scales and causes me to consider at least a dual meaning here. “re.d ex.tend.ing” may just be referring to the extending of habitat of plants and insects or may be a reference to redshift and doppler effect in which wavelength gets larger and cooler toward the red end of the spectrum. Red is a color that keeps recurring in poem after poem of Zach’s. 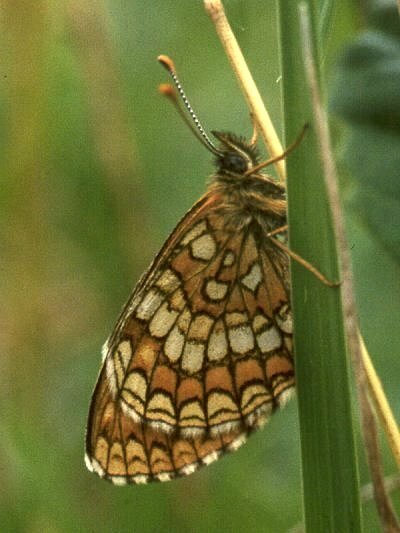 “Athalia Ambigua” is a Checkerspot that has a geographical range that stretching from southern Siberia through Mongolia to Northeast China. Through these species of butterflies we get a sense of global scale. What links all these things then: weaving/textiles, butterflies, skin cancer? It would seem to be “maculation,” a term Zach uses explicitly in the middle of the poem, in section ii. The dictionary defines this as: “the act of spotting or staining or the condition of being spotted or stained; the spotted markings of a plant or an animal, such as the spots of the leopard; a pattern of spots, as on certain animals and plants.” The spots can be a pattern for decoration to attract a mate or for camouflage to hide an animal from predators or from prey, or a stain due to blight, attack, disease or possibly aging. At the same time butterflies which carry these markings are to us symbols of liberty, transcendance and spirit because of metamorphosis: a transition from something lowly and earthbound to something capable of flight and beauty—they enact a picture a creature that lives two lives separated by sleep/death. Why write this poem using latin genus names instead of the usually more lyrical and prettier common names? Why the ruptured syntax? Why the interspersal of periods in the middle of words, usually at the break of a syllable, but not always, and why have the numbers 8 and then 9 at the beginning of lines seemingly randomly, but possibly to denote count of wings or butterflies? It’s a disjunctive technique which translates metaphorically: fracture, rupture and alienation, but also inescapably, playfulness; strange. Uncommon.